what inspires her, what makes him turn the page, where he struggles, where she could use a hand. Effective teaching moments are shaped by insight. This is the purpose and the power of good assessment. It all starts with quality data. 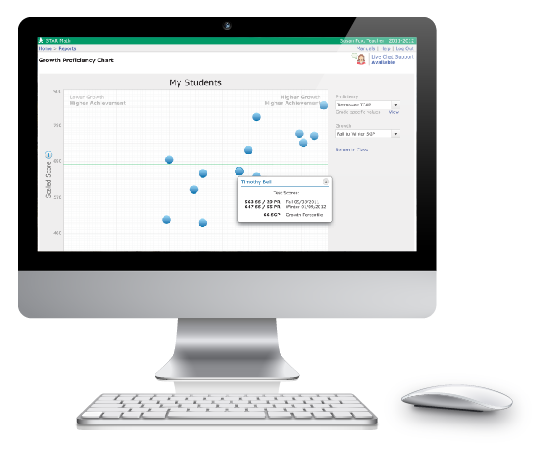 Our assessments use computer-adaptive technology and extensive item calibration to give you an accurate window into each student’s academic progress. We do this as quickly as possible, and as easily as possible, providing the highest quality data in the least amount of time. So you can get back to teaching as effectively as possible. With over 45 million Renaissance Learning assessments completed every school year, we harness a never-ending, constantly growing stream of data to make our tests more precise. And we continually build and expand our test items to meet the needs of today’s more rigorous standards. All that rigor adds up to assessments that have been independently recognized for the highest levels of validity and reliability. Lifelong learners are created by effectively connecting assessment, teaching, and learning. But if these three components of the learning cycle don’t work together seamlessly—if gaps emerge—information is lost, opportunities are missed, then a student’s potential is put at risk. Our assessments provide detailed reports that describe exactly what each individual student needs at any given time, not days or weeks later when the best opportunity for helping a student has passed. With the most reliable, actionable, and timely data available, we can help teachers keep students on track for college and career readiness. To make the most of your valuable teaching time, you need to know how each student is progressing, and any skills they may have missed. Our assessments are designed to make the most of teaching and learning time, while meeting many assessment needs at once. And we do it in just minutes, with tests that are easy to administer. That means more effective check-ins with students, more accurate and timely information, and more quality classroom time. So you can spend less time administering tests and more time teaching—the way it should be. The secret to continuous insight. The most widely used assessments in K12 schools. Take a look at more of our products here.